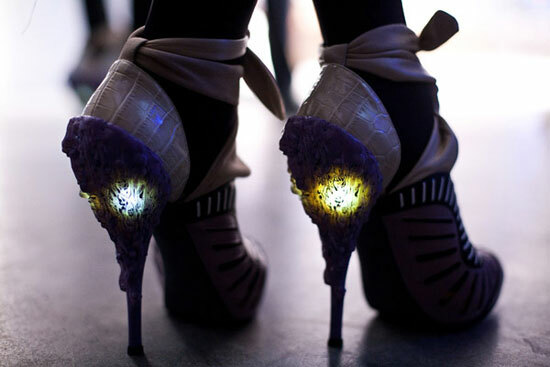 Rodarte Illuminated Heels | Ooh, my favorite! Enter your email address and get the latest Favorites in your Inbox. Nicholas Kirkwood of London has designed these for Rodarte’s fall/winter collection. Didn’t Reebok/Sketchers/Stride Rite pave the way for these? Ha! A quick search on Zappos says yes. Good old Zappos even has the flashing lights in the thumbnails. Hrmm…now I’m not saying I wouldn’t be up to trying these out. I actually think they’re pretty interesting; I’m just not sure I can shake the image I have in my head. The flickering lights on the heels of a slew of hyperactive kids running amock in the mall (the creepy dead end of the mall at that!) may be too far ingrained for me to be open-minded about these. left you somethin at my blog (livinwide.com)! nicholas kirkwood can do no wrong in my eyes. i think those heels are killer!